Preparing to Sound the Alarm and other artwork by artist Thomas Blackshear can be viewed in our artist slideshow. Preparing to Sound the Alarm by artist Thomas Blackshear and other Thomas Blackshear II art, art work, artwork, canvases, giclees, images, limited editions, open editions, paintings, paper, pictures, posters, and prints can all be found at Christ-Centered Art. Preparing to Sound the Alarm by ebony artist Thomas Blackshear depicts a female African American angel holding a shofar as she waits on God's command to be revealed to her. She will blow the horn (trump) and gather all of the angelic warriors together for battle, thus ushering in the Day of the Lord as mentioned in Joel 2:1. 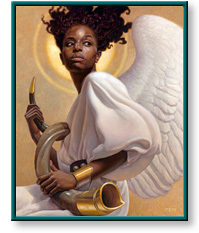 This painting took Thomas Blackshear II nearly 10 years to complete and is his first painting depicting a female angel. from Stonecrest Collectibles, and is individually numbered and signed by the artist Thomas Blackshear. The following print caption is included on the white border centered below the image. "Blow ye the trumpet in Zion, and sound an alarm in my holy mountain: let all the inhabitants of the land tremble: for the day of the LORD cometh, for it is nigh at hand."